I like this reasoning. Thanks. I would like to add that folks w loads of cultural capital have a textbook cost approaching zero at my institution. My sophomore and junior years i borrowed books from older colleagues. Period. I didn’t care about my major (comp sci) so didn’t want to keep the books anyway so i borrowed and returned. Copyright laws here are strict inside the uno but not outside it so ppl used to photocopy entire books (becoz copyright law is so unjust i stopped caring about this ages ago but can’t officially endorse it as faculty) and that costs v little. But not all students know this trick. Except by sophomore or junior year you “get it “. * To increase the resale value of a textbook, some students would never highlight or make notes in it. Don’t pity the gaunt Perdimians! They are proud. There are resourceful Perdimians! I have no doubt. Some people can make a feast out of salsa, cheese ends, and a tin of tuna. 1. Calculus texts generally cover 2 or 3 semesters of content. (They are your most expensive purchase.) Why does this student need purchase 2? 2. 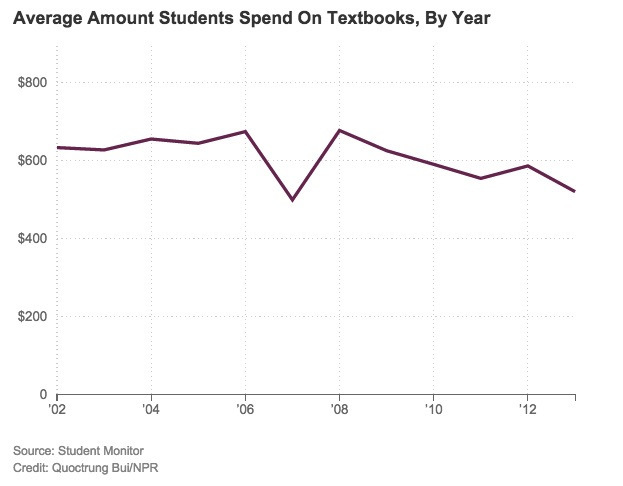 I don’t believe it is a correct assumption that 1/2 of a typical student’s purchases are new textbooks. I think it is lower than that. Do you have a source for your assumption? 3. And one reason students don’t always buy required course materials is instructors, often adjuncts who don’t choose – or like – the required book, tell them they don’t need to. That s a high percentage of students avoiding textbooks, avoid or dropping courses, and performing poorly due to costs. And this type of data is only available by asking students.